Celebrity Voice Impressions for bits, calls, imaging and more! Radio has been very good to me. Not only has it given me great opportunities to talk to and laugh with some famous people, it opened the door to me doing voice-over work and starting my own business. During the 2016 Presidential campaign, I was fortunate enough to have not one, but two opportunities to speak with Democratic Presidential Nominee Hillary Clinton--both as her husband, former President Bill Clinton, and Donald Trump. The calls aired during Primary Election Day in Michigan on "Mojo in the Morning"/Channel 955 in Detroit, and the morning of Election day, on 107.5 KZL's "Jared & Katie"/Greensboro, N.C.
Drex and Maney on Kiss 95.1 in Charlotte had a clever idea for a prank: Do their interview with Justin Bieber as scheduled, but then switch things up, explaining to him that they were double-booked with interviews, and "Regis Philbin"(Eric) was going to come on with them too, if that's okay. What was the Biebs gonna do? Priceless. "We used Eric's killer Regis voice to pull a prank on Justin Bieber! It was hilarious! Voice pranks only work when you have a great talent that can pull it off! Eric is the only guy we would ever use on air! There's nothing better than doing an impression of someone, for that someone! Regis Philbin called into the Mojo in the Morning show one day, and he gave me his seal of approval. "There's a guy in New York who's pretty good, but I gotta admit, Eric holds his own!" In 2007 I was thrilled to meet voice actor Nancy Cartwright, famous for her Bart Simpson voice. Rick Dees knew I was excited, and he made the meeting extra special on the air, having me perform for Nancy. It's not every day that you get the chance to talk to a former President of the United States...AND make him laugh. Mojo was nice enough to let me have that chance with Jimmy Carter. 2004. Former President Bill Clinton's memoir, "My Life" had just been published and there was a big gala in NYC to celebrate. I read an article where Andy Rooney of 60 minutes attended. We just happened to have his phone number, so, why not have Clinton give him a call? "Hey, great to talk to ya. I thought it was a put-on at first...now I can hear." June 3, 2004. One of the best moments of my radio career to date. 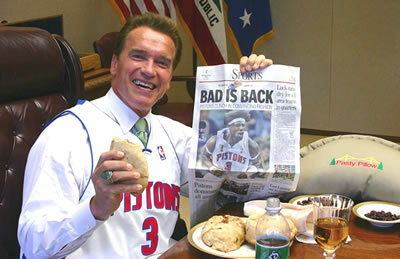 The Detroit Pistons were set to play the Los Angeles Lakers in the NBA Finals, and we thought, hey, let's have California's Governor Schwarzenegger call Michigan's Governor Granholm and make a friendly wager. The rest is history. Technically, I've talked to two U.S. Presidents. This was a call then-Texas Governor George W. Bush made to Mojo in the Morning on Primary Election Day, February of 2000. I figured he needed a pep talk from his dad. Meeting Casey Kasem, and doing Scooby with his Shaggy was the best. It was like a childhood dream come true. I sent him a thank you note after meeting him, and he called me personally to thank me for it. He is perhaps the nicest guy I've ever come across in this business. First off, I don't pretend that I can do a great Tom Brokaw impression. But I did it on Mojo in the Morning during the Presidential election coverage. For my birthday in 2000, Mojo surprised me by having the "real" Tom Brokaw on hold listening, while I exaggerated those hard to say 'L' sounds. My face was redder than the 'on-air' sign.